We’ve already talked about how amazing Greece was, but we also wanted to offer a bit of insight in the form of traveler’s tips. I mean we are 2 Girls Who Travel, so don’t worry – WE GOT YOU! What we decided to tackle in this blog is the fine art of island-hopping – essentially it’s how to travel from island-to-island in Greece. We researched beforehand by scouring travel sites, Facebook posts and forums on the topic, but you can never be too informed. A good tip or two can literally be the difference between a vacation in paradise and a vacation headache. Read on to find our tips on the best way to island-hop in Greece! Essentially there are two ways to get from island to island in Greece – by air or by water. We took advantage of both to get the full experience. There are pros and cons with each. Air travel is obviously quicker, but can be a little pricier, depending on the airline. We flew Olympic Air, a subsidiary of the Greek Aegean Airlines, and we had no problems. Some of the island’s airports are tiny though – like the one in Mykonos (JMK). Don’t expect to do or eat much while you wait – and there may not be a seat for you! Water travel is done on the ferry. This takes substantially longer (several hours, depending on where you stop), but prices are far cheaper. We paid 36.50 euros (about $43) per person. While on the ferries, you can opt for a window seat and see the water. You can also go to the top level where it’s open and you get the best views of the beautiful Aegean Sea. We highly recommend doing this! Views from the top of the ferry! 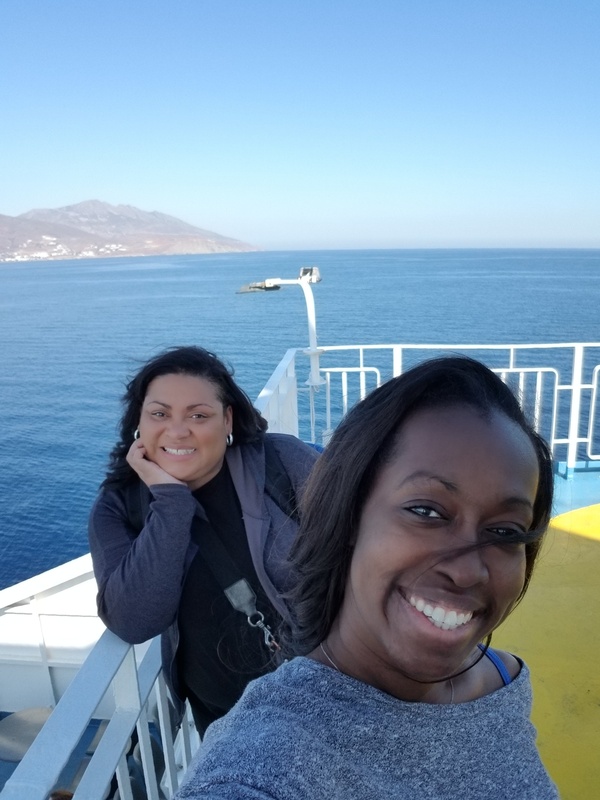 We visited Greece in late October, which is literally just the beginning of their tourist “low season.” While that worked out better for us with pricing and avoiding crowds, it also means there are less options for inter-island travel. This means you have less flexibility on which islands you can feasibly travel to and what times of day as well. Again, we traveled during the beginning of low season, so our travel operators were subject to change. That’s what happened on our ferry ride from Athens (Piraeus port) to Mykonos. It’s not a huge deal. We got an email well before the trip to inform us of the operator change. The times on the itinerary did change as well, so be sure you coordinate this with your taxi, driver or whomever. Tip 4: Crete can be hard to get to! We were dying to go to Crete. Seriously, not visiting Crete was not an option – until we had no way of getting there. The ferries had no departures for us during our visit so that was out. As for flights, there were only two departures from Athens to Crete – yes only TWO flights per week! 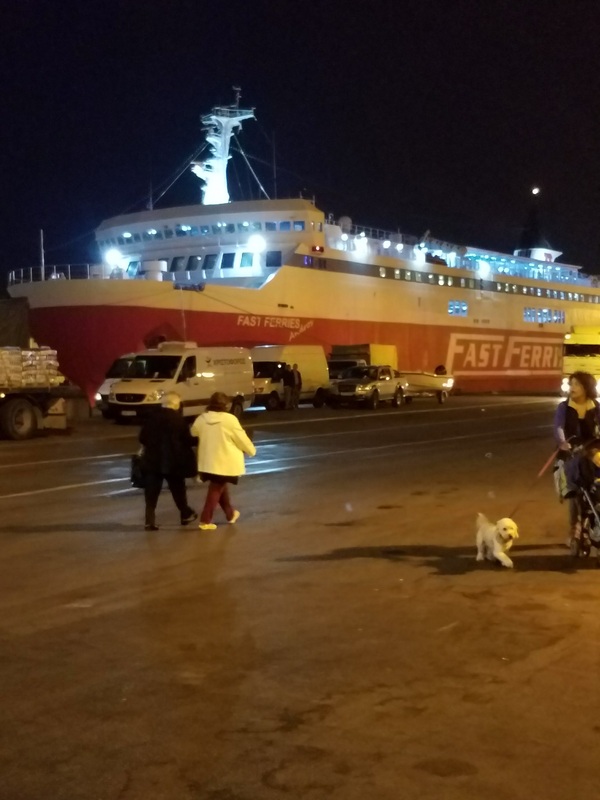 Even when trying to reverse our itinerary order, we couldn’t manage to travel to Crete and get back to where we needed to be, so alas, it just didn’t work. Again, this was mainly due to traveling in the low season, but if you have your heart set on seeing an ancient castle in Crete like we did, keep this in mind! Originally, on our 7-day trip we wanted to visit the islands of Mykonos, Santorini and Crete. So prior to our trip (still in the planning stages), we pulled out a piece of paper, pencil and Google maps and mapped out our desired route. Now keep in mind, what looks like it makes the most sense to you on paper may not be the best or easiest route when looking at available departures for flights and ferries. Be sure to cross reference your map with what’s available. For example, you may think it best to travel from Athens to Mykonos to Santorini to Crete because of where the islands are positioned, but you may only have the option of traveling from Athens to Crete. So keep an open mind and do what makes sense for you and your trip! Previous post5 Things We Love About Greece!